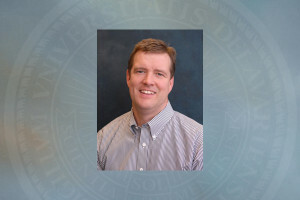 Eric Wommack has been named to the position of associate dean for research and graduate programs and deputy dean for the College of Agriculture and Natural Resources (CANR) at the University of Delaware. Wommack assumed his new responsibilities on Wednesday, April 1. Wommack, a professor of environmental microbiology in the Department of Plant and Soil Sciences, has worked at UD since January 2001. He also holds faculty appointments in the marine biology and biochemistry program in the College of Earth, Ocean, and Environment and in the Department of Biological Sciences in the College of Arts and Sciences. CANR Dean Mark Rieger said that he is “pleased that Eric has accepted the position and is coming on board immediately. He has had a stellar career at UD and is well respected for his research and graduate student mentoring. Importantly, Eric has strong collaborations with the Department of Biological Sciences and the School of Marine Science and Policy, and has some great ideas for enhancing interdisciplinary collaboration between our college and others at UD. The tough problems in agriculture and natural resources only get solved via strong, interdisciplinary efforts.” Of the appointment, Wommack said that he is “incredibly flattered and honored with the opportunity to hopefully make a difference in what we do.” One of the aspects of the job that he is really looking forward to is helping grow an already strong graduate research program at CANR. “Graduate education and research has been my focus the entire time here. I’ve trained over a dozen graduate students who have gone on to do great things and I’ve always valued working with graduate students and with undergrads in the lab,” said Wommack. Wommack said he is looking forward to working more closely with his faculty colleagues and that he enjoys the university setting “because I’m around really bright and creative people every day.” Wommack received a bachelor of science degree in biology and a bachelor of arts degree in economics from Emory University, a master’s degree in physiology from the University of St. Andrews in Scotland and a doctorate in marine estuarine environmental sciences from the University of Maryland.